Usually I am against books offering general study advice, I favour those that focus on a particular subject. (Which is why I wrote How to Think Like a Mathematician . Mathematics students may also be interested in Lara Alcock’s How to Study for a Mathematics Degree .) 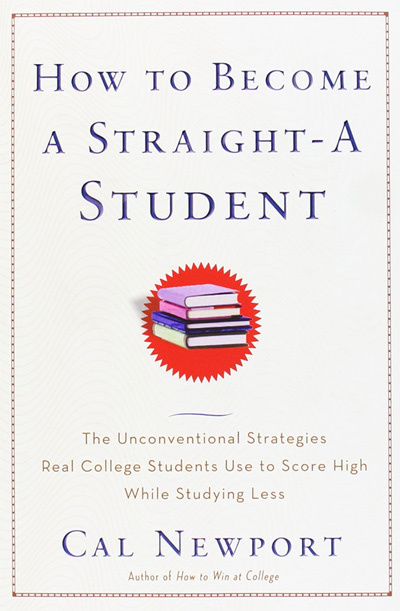 I’ll make an exception for Cal Newport’s How to Become a Straight-A Student . Let’s get the bad stuff out of the way first. 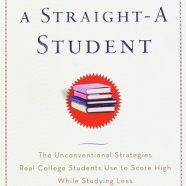 The subtitle is The Unconventional Strategies Real College Students Use to Score High While Studying Less which, along with the book’s other marketing, makes the scam-like sounding promise that you can do less work and get better grades. This can of course happen but does lend the book a feeling of too-goo-too-be-true. Furthermore, the book could do with some trimming of excess material though, at 216 pages, it is quite short for this type of book. The book could do without the regular mentions of partying and beer swigging but I suspect I’m not the target market for those bits. Whether it’s philosophy or calculus, the most effective way to imprint a concept is to first review it and then try to explain it, unaided, in your own words. Most students make the mistake of relying only on passive review; they read and reread their notes and assignments, and assume that the more they read, the more they will remember. As I say in my book, be active, for example, study with pencil and paper to hand and use them. So as a new academic year starts here in the UK, if you are a new student, that would be my book to recommend for advice on general study techniques.